New larger version of our heart mixed metal pendant. This heart pendant is made from sterling silver, brass and copper. Each piece is hand cut from sheet metal, shaped, hammered and textured, and then soldered together. It is then patinaed to bring out the texture on the piece. A sweet little heart is stamped on the back. The pendant is then tumbled and polished. Due to the nature of the metals, the copper will oxidize over time. Some people love this natural process. However, if you prefer it to be shinier, just polish with a jewelry polishing cloth. Each order will contain a pro polishing pad for free! 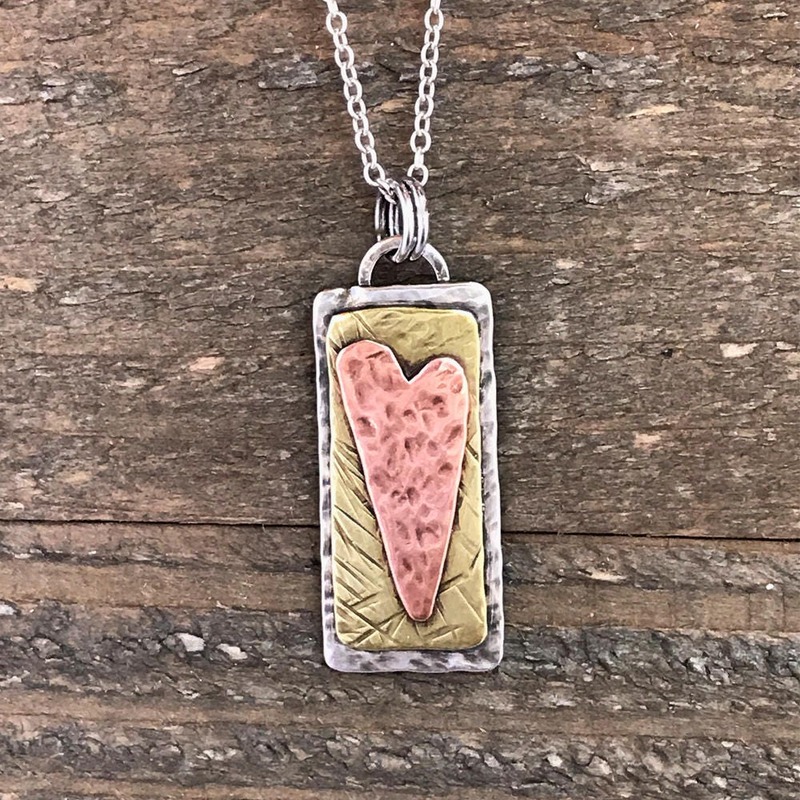 The pendant hangs from sterling silver jump rings and comes with a handmade sterling silver chain cable chain with a lobster claw clasp and has 2 inches of extender chain. Please choose the length of the necklace desired at checkout. The pendant measures approximately 5/8 inches wide by 1 1/4" high, including the jump rings. Please note that each piece is handmade at the time of purchase. Since this mixed metal heart pendant is all created from sheet metal, and each piece is hand cut and assembled, some variations, including variations in size, may occur. The necklace will arrive in a muslin bag for gift-giving and safekeeping. Each piece is made to order. Great care and time is taken to create each piece. Due to the nature of handmade items, some slight variations may occur. Each piece is created after it is ordered and is unique. "Imperfections" or "flaws" add to the character and uniqueness of each piece. Beautiful! My friend loved it! Interested in wholesale? Let's talk! I would love to work with you.